Where is the historical evidence for ancient Israel's Exodus from Egypt? 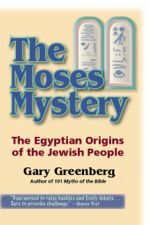 Sure to cause controversy in both academic and religious circles, The Moses Mystery examines the troubling question of why ancient Israel has no archaeological or documentary presence prior to and just after the Exodus from Egypt and challenges the conventional wisdom on the origins of the pre-Exodus Bible stories. Although the bible says that Israel’s formative history took place in ancient Egypt, biblical scholars and Egyptologists have steadfastly refused to explore the role of Egyptian history and literature on the origins of Jewish religion. Greenberg attempts to set the record straight. Marshaling an astounding amount of research in the fields of biblical archaeology and Egyptian history, literature, and mythology, Greenberg shows that the first Israelites were native Egyptians and that the history of Israel before the Exodus is based almost entirely on Egyptian mythology. ● The Twelve Tribes of Israel never existed. ● Abraham, Isaac, and Jacob were characters from Egyptian mythology. The biblical story of Jacob and Esau, for example, draws together several myths about the Egyptian gods Horus and Set (the feuding twin brothers who fought even in their mother's womb) and weaves them into a story about biblical patriarchs. ● The first Israelites were Egyptians, followers of Pharaoh Akhenaten, whose attempts to introduce monotheism into Egypt engendered rage among the religious establishment. ● Moses served as chief priest in Akhenaten's cult and, after Akhenaten's death, had to flee Egypt to avoid execution. ● Pharaoh Horemheb waged a bitter campaign to eradicate all vestiges of Akhenaten's heresy, eliminating the evidence stone by stone and word by word. As a result, Akhenaten remained lost to history until nineteenth-century Egyptologists discovered the ruins of his capital city. ● When Horemheb died, Moses returned to Egypt, united his followers with other enemies of Egypt, and attempted to seize the throne from Ramesses I. The coup failed, but to avoid a civil war Moses and his allies were allowed sale passage out of Egypt. This was the real Exodus. ● After entering Canaan, the Egyptian followers of Moses formed military alliances with local Canaanite kings and with some of the recently arrived Greek invaders known as the Sea Peoples. This nontribal alliance of small kingdoms and city-states became biblical Israel. This book was originally published in hardcover under the title The Moses Mystery: The African Origins of the Jewish People and in paperback as The Bible Myth: The African Origins of the Jewish People.